CACIT tests are only available in Slovakia, Russia and Lithuania. They are very strict hunting tests with fox. A vet is present and dogs are vet checked and documented. Patterdales are permitted even though they do not carry pedigree papers. The coveted CACIT is awarded by the FCI and if you gain two you are entitled to become an International Working Champion same as a CIB under FCI. From this it is possible in some CACIB shows to enter the working class. In Europe there are working classes in most national championship shows where CAC or CC are awarded. CACIB shows are international and the CACIT is valid. You need a Working Certificate issued by the cinofile association of that country. I have Working Certificates on my dogs issued by the French SCC and it is valid at national shows only. In Italy although my dogs are working champions, they are foreign dogs, and ENCI does not permit me to enter working class. Otherwise in the UK, unless you have hunt contacts, and can work with a terrier man and gain a Certificate of Gameness from a breed club such as one of the 5 Border Terrier clubs, it is impossible. But this might only entitle you to enter working at the breed club that issued your certificate and not at another breed club show. They are not transferable. Pity and it really does nothing for the terrier breeds. In the USA in the 1950s to be a champion a terrier had to have a certificate of gameness. I advocate this. I am tired of show ring terriers. They are earthdogs. They have lost their ability to hunt and be a dog. So I pursue all disciplines that I can train my dogs in. Foxes are natural to Border Terriers and I use frozen fox to train my dogs. CACIT tests are coveted and are by invitation. They are not publicised and unless you are known as a dedicated person you might have to wait a while to be invited. In Slovakia the Slovakia Terrier Club and the Slovakian Hunting Association run these tests. They are very popular and a great spectator sport. For the old and young. Many pensioners and ladies hunt their dogs and these people compete at the CACIT test hunt trials. I took my dogs to the Slovakia Terrier Club CACIT tests. I worked 3 dogs. My young female came into season so the vet pulled her out. The piste is a “U” shape and 24 metres in length. It is 18cm x 20cm which represent the natural earth. The liners are concrete and there are gates which are removed. There are gradients and some obstacles. In nature you would have stones and tree roots to negotiate. In Slovakia they are set up in theatre form as it is a great spectator sport. The terrier and tekkel is much respected and people come to watch the dogs work. In Eastern Europe of old, hunting is still a huge part of the way of life. It is highly respected and is part of the natural eco system of man and animals in nature. It is encouraged and controls the balance of animals in nature. It is a way of life that is exposed to school children as part of nature. It is not uncommon to see babies being buggied around at CACIT hunting tests. The draw positions are vital as pole position can mean a hard fox or a soft fox. They are changed at every dog and some 40 foxes may be dug out of the ground to be used at a test day. I drew 11, 13 and 55 out of 67 starters. My first dog had a very hard fox. My female had a very combative fox. My young dog had a good fox and he worked very well at his first time in contact with live fox. He has only worked gated fox prior. The adults work fox. The dogs are given 10 minutes to work the fox. The test may be over in seconds or the dog may hold the fox. There are 3 ways. Contact. Holding the fox or bolting the fox. Depends on the fox and how the dog works. The area is caged so if the dog bolts the fox then the fox is caught. Marking the dogs is in 3 phases also. Group 1, 2, 3 depending on how they work. Some dogs do not even bay at the fox they just go straight to the contact. Others may bay and mine will bay for up to 8 minutes. This would be the point the terrier man would locate the dog and the fox for bolting. My female likes to work and she worked well at challenging. Dogs need to be fit and have a good set of lungs. Baying is usually in order and quite important in the marking table. A good set of haunches is vital for pushing up the den at the crawl. The dog needs to be able to go backward also. If a dog jumps the fox in the holding box then the dog can bolt the fox. My male will do this. This is where the shoulder is very important as the dog has to pull itself up the den in the crawl. Despite being big my dogs have no trouble at speed crawling up the dens. I shudder when I see critique of difficult to span. Border’s are very flexible with a good length of rib and loin to turn in dens and crawl. Rib spanning is great but 99.9% of Borders, JRT, PRT never see a den or a fox or a horse. Big pelts help them slide around also. Den liner open. This is not working day but the day after. Photos are forbidden. Here the dogs are interested as there is good scent still. This is the beginning and followed by a short gradient the dog has to negotiate at the crawl. This is a great sport and one way to get your dog fit and prepare for the field. I use these trials for training. I am fortunate to be able to travel and I speak languages. I travel to where ever it takes to work my dogs. It is important that the dogs are allowed to be dogs and not anthropomorphised. 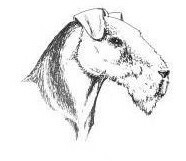 I believe that terriers should be off the judge’s table and into the ground. The next tests are in Slovakia with the Hunting Association in July. It is for terriers and tekkels. 170 start.